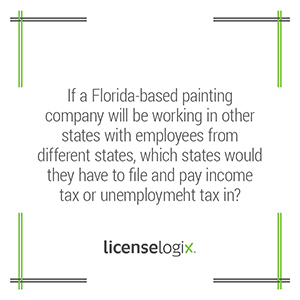 Would there be other state's taxes for FL-based company working out-of-state? Generally speaking you will need to register for, and then file and pay, unemployment tax in each state where an employee resides. Some states require payroll registration if any work is being done in that state, even if no employees live there. State corporate income tax varies as well. In some states a business must file and pay as soon as it started conducting activity within the state, in others the activity must rise to the level of “regularly transacting business” before the requirement kicks in. You could also have to set up a witholding tax account for every state you have an employee residing. It is important to investigate the state laws before operating or hiring an employee in a state. For additional help you can click contact us, or give us a call at (800) 292-0909.